Today, I have another lovely stroller to show you, the Mini Buggy XL by Easywalker. I recently reviewed the Easywalker buggy 2016, and this one shares a lot of the same features. Therefore, instead of repeating myself, I will focus on the differences between the two buggies. 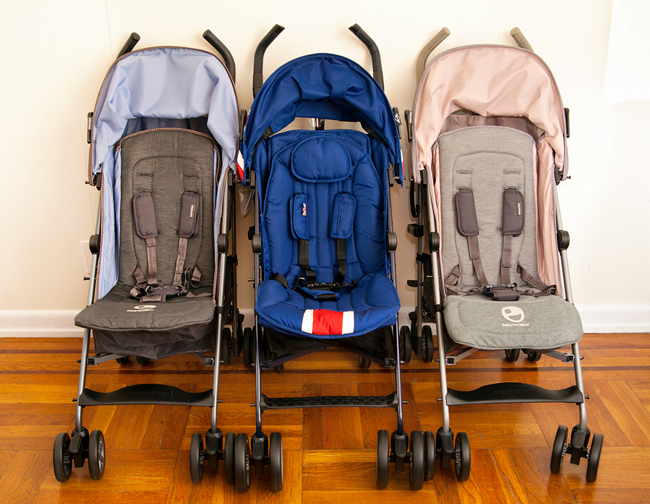 The Mini buggy is available in 6 colors and 2 versions, regular and XL. 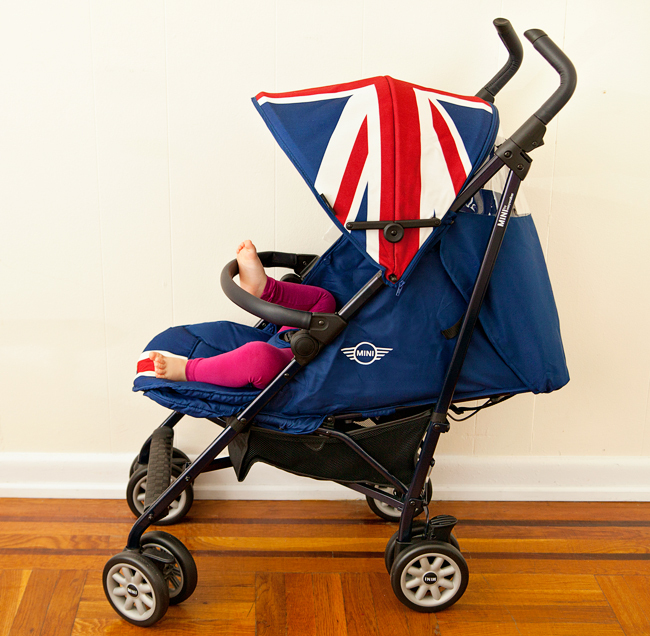 I was sent the XL buggy in Union Jack Classic for this review, compliments of Baby Jungle. The first and obvious difference between the Mini buggy and Easywalker buggy is in the design. The Mini buggy was created in collaboration with MINI of BMW Group and features iconic MINI design elements on fabric and wheels. While both buggies are gorgeous and made with a lot of attention to detail, the Mini has a few 'extras' which set it apart. 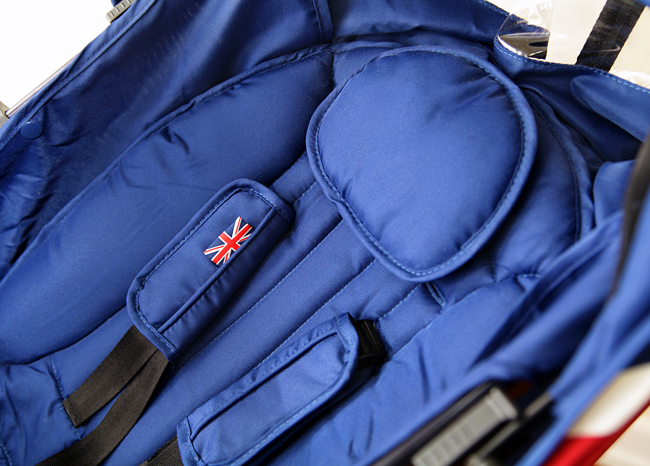 The seat on the Mini buggy has a plush liner, which can be conveniently removed for cleaning. There's also a small, removable head pillow for extra comfort. 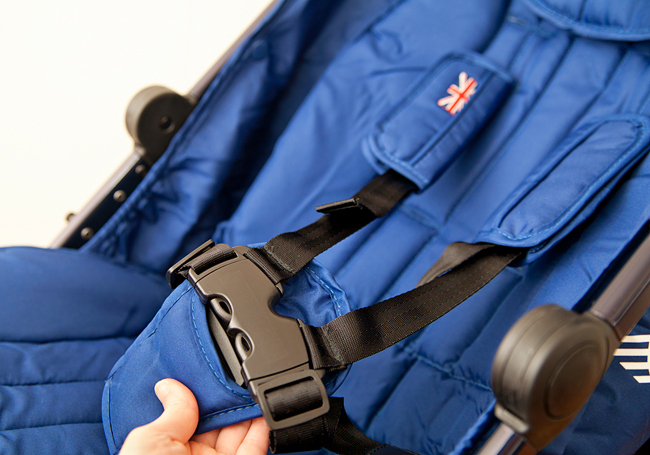 Although the textiles on the Mini buggy are beautiful and high quality, I prefer the seat fabric of the Easywalker buggy because it's softer to the touch and more breathable. The seat size and functions are almost identical to the Easywalker buggy: one-hand reclining lever, 4 backrest positions, including completely flat, adjustable leg rest and very easy to adjust, 5-point harness. The seat is roomy and tall and can accommodate a child from birth to 20 kg (with additional 5 kg in the underseat basket). 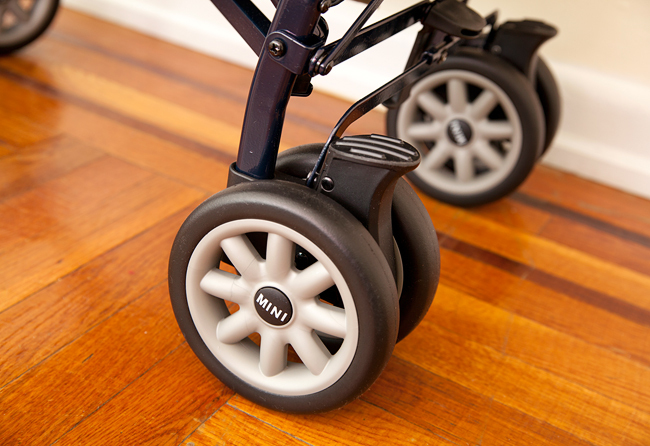 The leg rest on the Mini buggy is 4" inches long, as compared to 5" on the Easywalker buggy. Among other accessories, Easywalker offers a matching, leatherette covered bumper bar for the Mini buggy, which can be purchased separately. A bumper bar is a very useful stroller accessories, which I highly recommend investing in. Besides for the design, the XL version of the Mini buggy differs from the Easywalker buggy in two areas: handles and wheels. 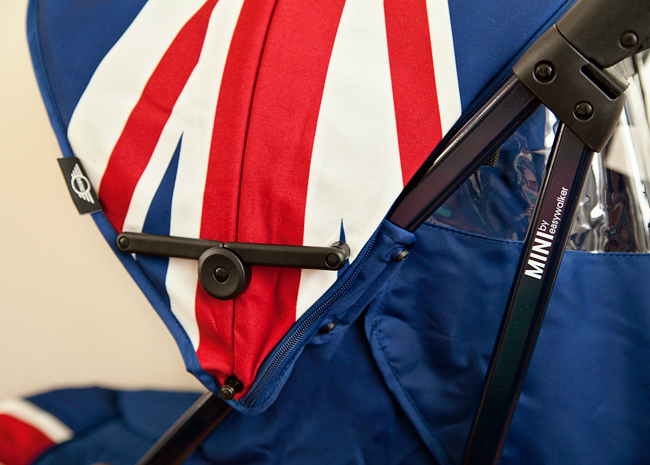 Just like on the Easywalker buggy, the handles on the Mini buggy are ergonomically shaped and covered in leatherette. What makes these handles unique is that they are also height adjustable. When extended, the very top of the handles measures 44" from the ground, vs 41.5" on the Easywalker buggy. The extendable handles are a very convenient feature for taller parents, however this convenience comes with a small downside. There's some minor wiggle in the handles, which is present even when the handles are in the lower position. 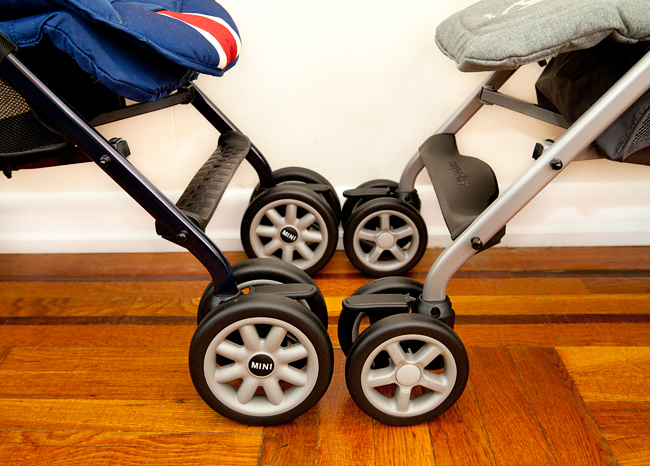 The XL version of the Mini buggy is made with 15 cm wheels, as compared to the 12 cm, on the Easywalker buggy. The larger wheels are better at handling grass and uneven pavement. The Mini buggy XL is also equipped with all-wheel suspension. We have pretty bad pavement near our home, and the ride in the Mini buggy XL was noticeably smoother than in the Easywalker buggy. The larger wheels do add a bit more weight, making the Mini buggy XL 8 kg (17.6 lbs) as compared to Easywalker buggy weighing 6.5 kg (14.3 lbs). 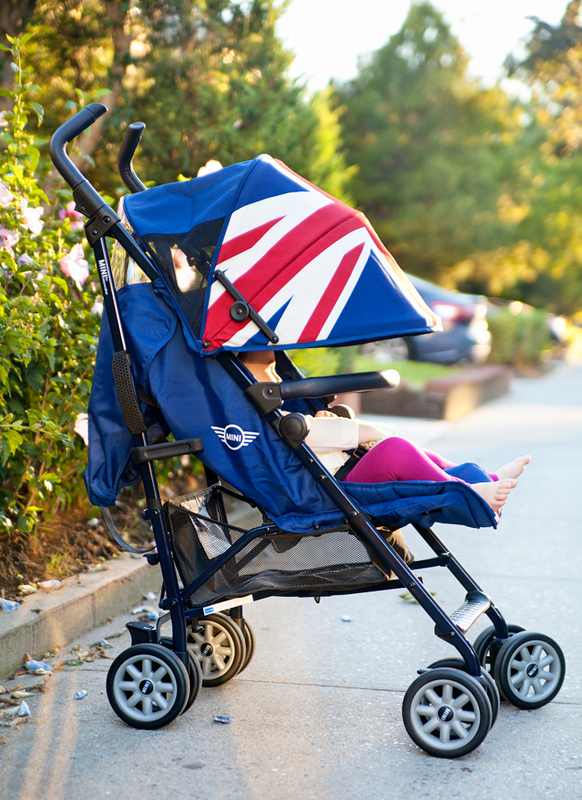 The break pedal on the Mini buggy is a slightly different shape, but it's still flip-flop friendly and functions exactly as on the Easywalker buggy. 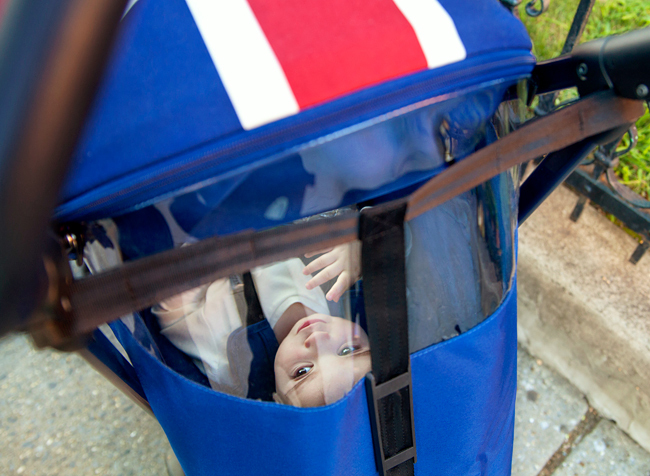 Just like on all Easywalker strollers, the canopy on the Mini buggy is very well designed. It is lined and expands to provide superb protection from the elements. The two mesh inserts on either side of the canopy help with air flow, and there's a vinyl viewing window in the back. 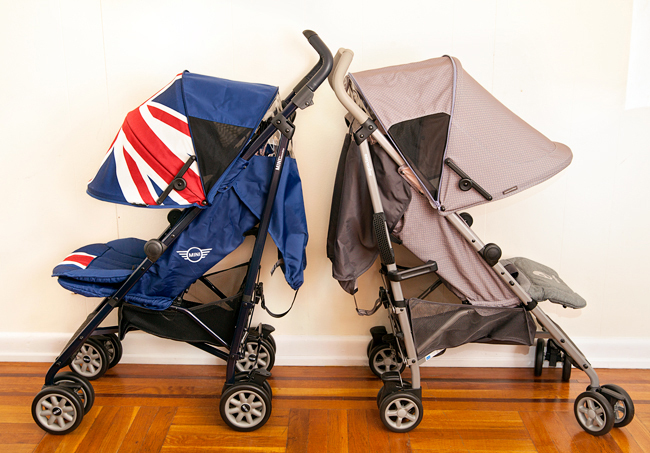 As you can see in the comparison photo, the shape of the canopy on the Mini is different from the Easywalker buggy. It's designed with 3 panels, giving it a more rounded appearance. Abby, age 1.5 was not very happy when I lowered the canopy over her because it obstructed too much of her view. 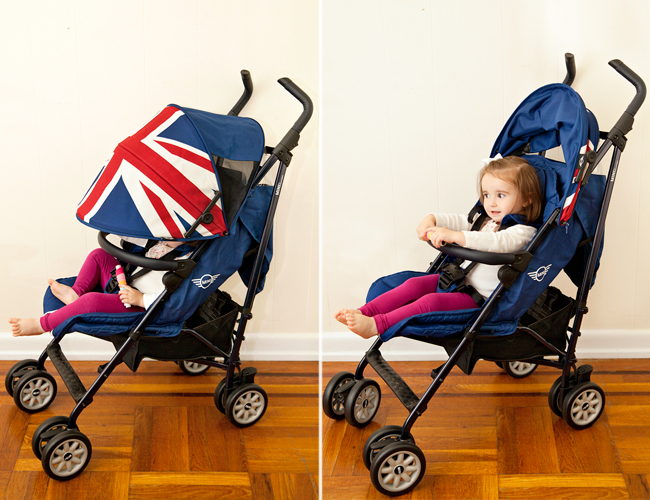 She preferred the shape of the Easywalker buggy canopy, which extends more forward, rather than down. A variety of accessories are available for the Mini buggy XL. A matching leatherette covered bumper bar is really great to have in my opinion. Little Missy loves leaning on it and sometimes propping up her feet. The buggy folds with the bumper bar attached. Another great accessory is a matching winter footmuff. This footmuff is very generously proportioned and fits babies and toddlers alike. Little Missy at almost two, still has plenty of growing room in it. The footmuff is lined in soft, cozy fleece and has a zipper on both sides. 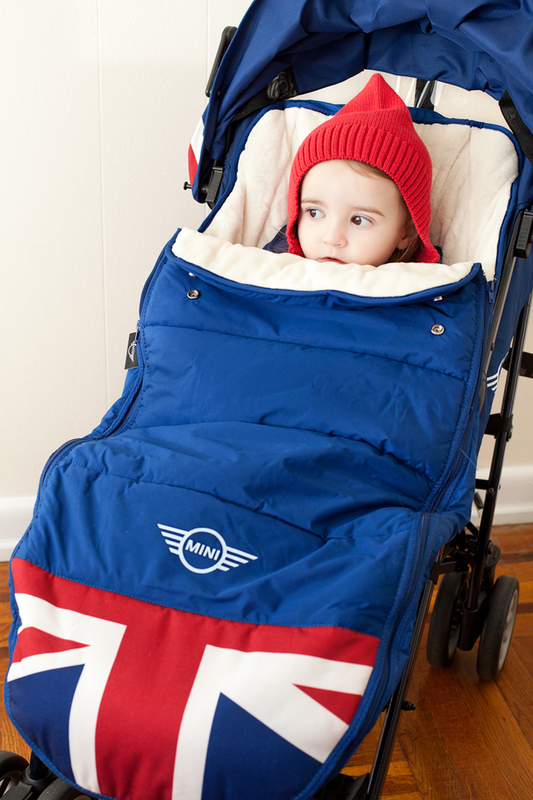 The top portion can be zipped off entirely, leaving just the underside as a warm stroller liner. Of course the footmuff has openings for a 5-point harness and can be used on most strollers. Other available accessories are car seat adapters, parent cup holder, child snack tray, rain shield, mosquito net, and more! Both, the Mini buggy XL and Easywalker buggy 2016 are gorgeous, luxury umbrella strollers, made to high standards. Both strollers have exceptionally comfortable seats for babies and toddlers alike, and both are travel system compatible with car seat adapters. It's really hard to say which of the two buggies I prefer more, since both have their advantages. I really like the larger wheels and the removable, plush seat pad on the Mini buggy. Since I'm petite, I don't need the extendable handles feature, but I can see how it can be a deal breaker for taller parents. I prefer the pastel colors, the canopy shape and the seat fabric on the Easywalker buggy, though I wish it had larger wheels. 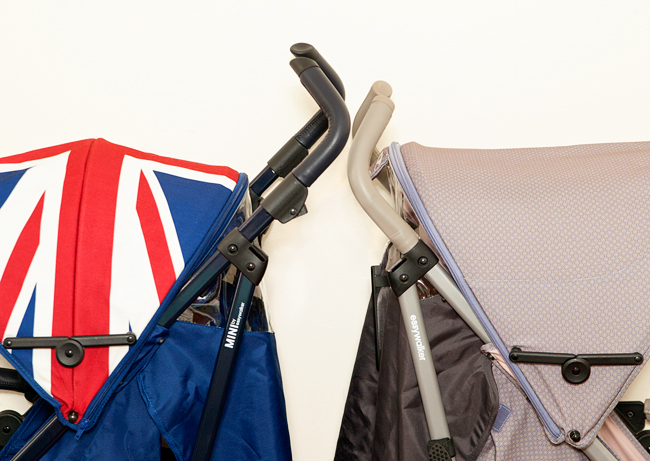 No matter which of these two buggies you choose, rest assured that you're getting a top quality umbrella stroller that your child will love riding in and that you will feel proud pushing! 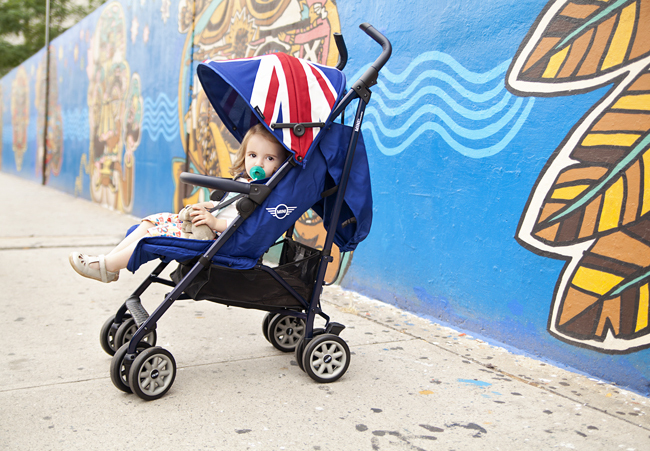 A great big THANKS to Baby Jungle for sending a stroller for this review! Baby Jungle is located in the Netherlands and ships worldwide.